WASHINGTON, D.C. — On Wednesday, the Senate approved a three-week extension of the surface transportation program, as well as a provision that extends the deadline for installing positive train control (PTC) to 2018, and under certain circumstances, to 2020, The Washington Post reported. Additionally, the Senate approved the nomination of Sarah Feinberg as head of the Federal Railroad Administration. The extension of the bill until Nov. 20, is the third extension this year. It is hoped this will be the last extension as House and Senate conferees continue to work to get a long-term bill passed. For the full story, click here. "On behalf of the public transportation industry and the millions of daily riders we serve, APTA applauds the United States Congress for extending the PTC deadline for the commuter and freight rail industry to Dec. 31, 2018. Today the Senate passed a three-year extension for PTC as a part of passing a short-term extension to authorize the surface transportation bill. Additionally, the short-term extension allows public transit and highway programs to continue to operate while Congress continues to work on a long-term authorization bill. The House had passed the measure the previous day. 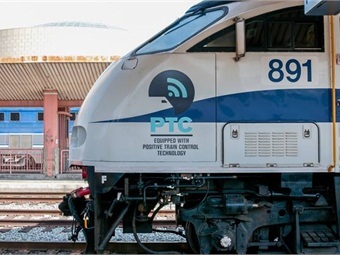 Safety is the number one priority of the public transportation industry and the commuter railroads are 100 percent committed to developing and installing this life-saving PTC technology. The extension will allow for commuter rail operators to achieve the goal of ensuring this PTC technology and its many components are developed, installed, and tested successfully and safely. Transportation is the backbone of our economy. This three year extension of PTC implementation avoids the risk of an economic crisis that would occur if the nation's commuter and freight rail systems were force to shut down at the end of the year. By implementing a realistic timeline for PTC, the disruption of Americans who take nearly two million daily trips on commuter rail systems every weekday was avoided. This extension prevents the shifting of these daily commuter rail trips onto overburdened roads which could have contributed to an unsafe commuting environment. We look forward to working with Congress in appropriating the funding to assist the industry in complying with this essential safety mandate." "Members of the House and Senate are to be commended for taking the responsible action to extend the PTC deadline. This provides the certainty American industries and businesses need to serve the millions of Americans who rely on rail every day," said Hamberger. "The extension means freight and passenger railroads can continue moving forward with the ongoing development, installation, real-world testing and validation of this complex technology." “The rail industry remains fully committed to being accountable and transparent in completing PTC and we look forward to working with Congress to get a broader long-term surface transportation bill to the desk of the President expeditiously.